01-31-15: A 2015 Interview with Christine Carter, Ph.D.
"...being able to see what happens in the brain really helps us to understand certain things..."
I prefer to do my interviews in person, and my gig was Christine Carter is a great exmple why. 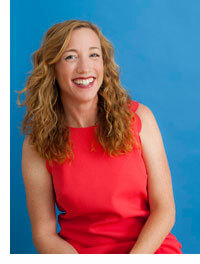 We sat down to talk about her book, 'The Sweet Spot: How to Find your Groove at Home and At Work,' and before I knew it, we'd whooshed past the hour marker that we had at KQED effortlessly. I suppose I should not be surprised it was an interview that took place in the sweet spot, but the experience was nonetheless a bit eerie. I just admit that I was greatly enamored of her take on habit; what they are, how they are formed and unformed. It reminded me of an old Stanislaw Lem riff on the search for artificial intelligence, where he suggests that it's much smarter and easier to try to create artificial instinct (in my tiny brain, "habit"), and that with little intellectual horsepower, you can accomplish a great deal of good work. What you hear when you listen to Christine Carter is, simply put, authenticity. She has a down-to-earth presence that enables those in her general vicinity to also reach a state of both feet on the ground. If I heard her speak, I'd read the book. Having spoken with her and read the book, I have to admit that my do-list, which has grown ever larger, somehow seems less imposing. You can hear her speak by following this link to the MP3 audio file. 01-31-15 UPDATE: Podcast Update: Time to Read Episode 194: Christine Carter, Ph.D. Here's the one-hundred ninety-fourth episode of my series of podcasts, which I'm calling Time to Read. I've been worjking for more of a live format lately, and to this end in this Time to Read "lightning round," I've included some of the banter beforehand, to give a feel for the atmosphere when we run these little mini-interviews. The boom line: THey're a fun way to finish off the gig. 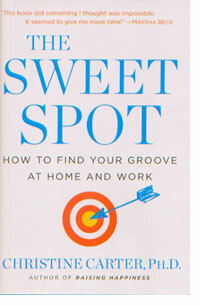 Here's a link to the MP3 audio file of Time to Read, Episode 194: Christine Carter, 'The Sweet Spot: How to Find Your Groove at Home and Work'.